There are two ways to do Fish Canyon Falls, the easy way on the weekend with the shuttle bus that takes you to the old trail head, and the hard way up the side of the mountain when the shuttle bus isn’t running. I read a few reviews of the “hard way” that scared me. Hikers described the trail as poorly maintained, overgrown, with near vertical ascents. I put off this hike until we had a good rainstorm, because if I was going to suffer on the trail, I wanted the falls to be raging. Today, I finally got a chance to visit the falls for the first time. 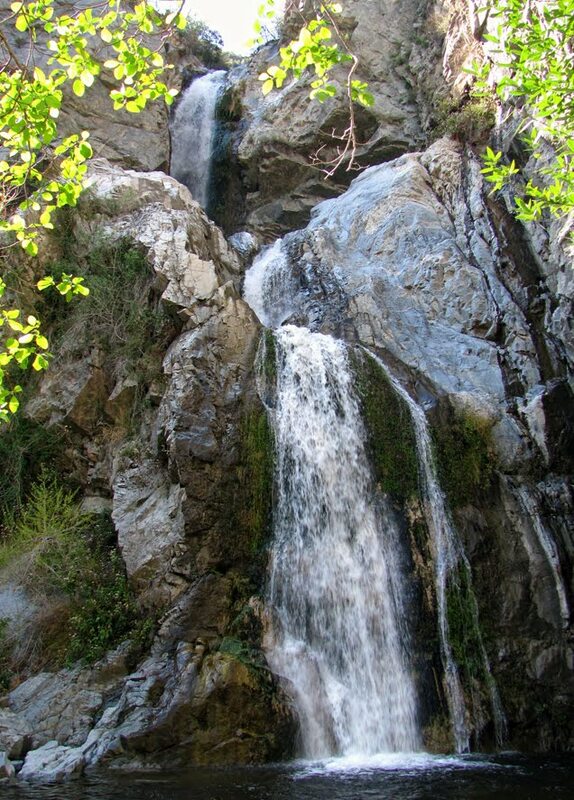 I can say without hesitation that Fish Canyon Falls is the best waterfall in Los Angeles County. The hard trail over the mountain starts at the end of Encanto Parkway in Irwindale. There is a decent dirt parking lot on the left side of the road at the mouth of Fish Canyon just before the locked gate at the rock quarry. If you could walk through the quarry, you would be able to shave off 4 miles off the 9 mile round trip and 3,000 feet of elevation gain, but you’re not allowed to cut through the mouth of the canyon unless you get permission from the mining company. God, I wish I had called the mining company. We started the trail in the parking lot and trudged our way up a never-ending series of switchbacks. The trail was not as overgrown or poorly maintained as I had been warned, but it was every bit as steep as promised. The uninterrupted views of Azusa were the only thing that kept me motivated to keep hiking up that mountain. The half mile up the wide fire road to the summit is the worst part of the trip. By this time, I was openly cursing the mining company. It was a breezy 70 degree day, and I was sweating like a stuffed pig by the time we reached the summit. From this point, the trail descends into Fish Canyon. When you finally meet the original Fish Canyon trail at the bottom of the mountain, the hike takes on a whole new character. You very gradually hike upstream on a gentle canyon trail with views of the river cascading below you. At about 4 miles in, you come to a small tributary on the left side of the canyon that feeds the river. There is a little 25 foot waterfall about 100 yards upstream of the tributary called “Donna’s Darling”, or “Darling Donna”, I’m not sure which. It was worth mentioning as a 5 minute detour. We headed back to the main trail and made one very easy river crossing. At this point, you’re now hiking on the right side of the canyon and you are less than a quarter mile from the falls. When you come around the last bend, the falls finally come into view. It’s a 100 foot, four tiered waterfall plummeting into a large pool at its base. It was absolutely furious after the rain storm. We sunned ourselves at the base of the falls while we ate lunch and snapped a bunch of pictures. On the way out of the canyon, my girlfriend and I decided to bypass the mountain and take a highly illegal detour through the rock quarry. We hopped a fence or two and turned what would have been a grueling 2 hour return trip back over the mountain into a leisurely twenty minute stroll back to our car. And you know what? After hiking over that mountain on the way in, I didn’t feel the slightest bit guilty for trespassing. Its criminal that the mining company would restrict access to something so beautiful.